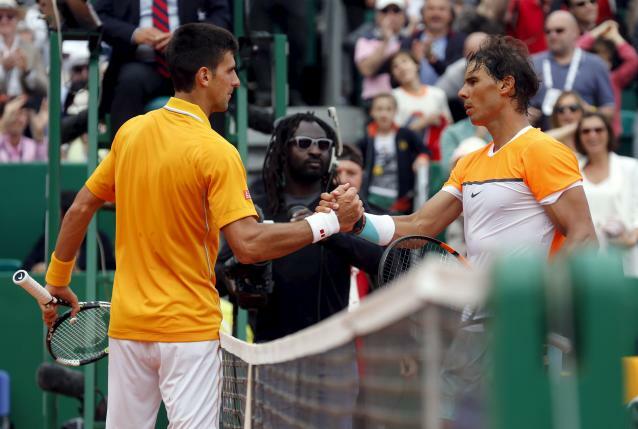 BARCELONA – A red hot Novak Djokovic is being tipped to end Rafa Nadal’s stranglehold at Roland Garros in June but the Spaniard dismissed the threat as being no different to those he has faced before. The Serbian world number one has been an unstoppable force in recent weeks, winning 17 matches on the bounce and becoming the first man to win the season’s first three Masters title. He comfortably beat Nadal on his beloved red clay in last week’s Monte Carlo Masters semi-finals, and the nature of Djokovic’s 6-3 6-3 mauling means plenty are backing him to complete his collection of grand slam titles this year by winning his first French Open. But as far as Nadal is concerned, 2015 is no different to 2013, 2012 or even 2011. “Djokovic was good in 2011, in 2012, 2013 as well as in 2015. Sometimes you win more and some you win less,” Nadal, who has triumphed at the French Open in nine of the last 10 years, told reporters at the Barcelona Open. “It is difficult to win everything all the time. Djokovic was as good then in 2011 as he is now. He had an impeccable year in 2011 as well as he is having in 2015. “I have to congratulate him. “The rest of the players have to accept that at the moment he is the world number one with all he has achieved this year,” added Nadal, who has had a patchy year after making his comeback in January following another lengthy injury and illness break. “This year I have to do things right, get back to a very high level to face him on the court,” Nadal said.